A woman who’s never been properly loved has a chance for a new start in life. Charity Penn is the illegitimate daughter of the much-married scion of a wealthy family. She’s never lacked for subsistence funding, but except for one half sister and Granny Mae, her relatives usually ignore her. When Penn gets a card telling her she’s won a trip to Camellia Beach, South Carolina, along with free cooking lessons at the local chocolate shop, she’s wary—who wins a prize for a contest she hasn't entered?—and asks her prep school friend Skinny, who’s traveling to a surfing competition nearby, to check it out. Soon Penn gets a voicemail from Skinny telling her he’s found exciting information and inviting her to come down. Before she can decide what to do, she learns that Skinny’s been found dead in a vat of chocolate. Packing up her feisty papillon, Stella, Penn heads south. The police insist Skinny was killed in a drug deal gone wrong, but Penn knows Skinny didn’t do drugs. Arriving in Camellia Beach, she meets Althea, the daughter of Bertie Bays, companion and helper to Miss Mabel, the chocolate shop owner who wants to teach her to make chocolate. Penn is quickly swept up in the tug of war between those who want to keep the natural beauty of the sleepy town and those who want to make a buck modernizing it. Even families are divided, as Penn learns when she meets two attorneys, Calhoun Dalton, a member of the tear-down group, and his brother, Harley, a defender of the status quo who had a nasty verbal encounter with Skinny the night he died. 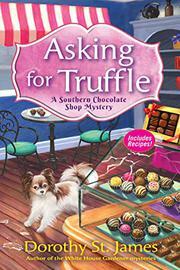 When Miss Mabel dies suddenly, Penn is shocked to learn she's inherited the chocolate shop—and so are Miss Mabel’s relatives. Since South Carolina law will pass the inheritance to the family if Penn dies before five days are up, she has the world’s best motive to solve the case. The first in a new series for St. James (Oak and Dagger, 2013, etc.) features an appealingly reflective heroine and a varied roster of suspects.